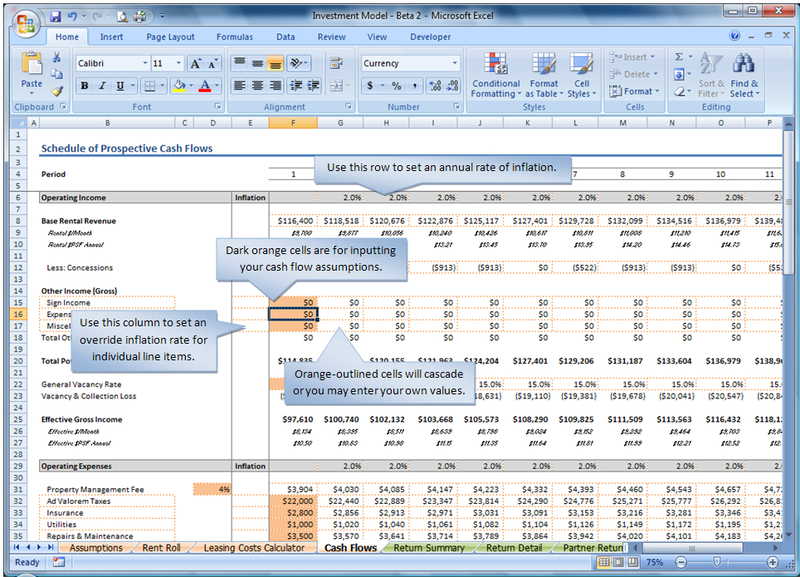 Cash Flows Tab - Real Property Metrics, Inc. The Cash Flows tab is where you will enter the operating data for your commercial real estate project. Based on the number of years you entered for the Hold Period on the Summary tab, you will see multiple years displayed. *By design you should see one (1) more period on the Cash Flow than you entered for the Hold Period. Excel Tip: Use the keyboard shortcut Ctrl+9 to hide rows you don’t need. Use Ctrl+Shift+9 to unhide them. If you have vacant space whose Tenant Improvements and/or Leasing Commissions have already been budgeted into your development/acquisition price, enter “$0’s” into the first year’s spaces under Capital Expenses. If you have any expected Capital Expenditures (roof, HVAC, etc.) in a given year you can enter them into the Capital Expenditures.